On a late, Sunday afternoon, while many of us are relaxing at home, Nathan Antonites is hard at work. This used to be one of his days off, but now he stands over ten pounds of sizzling, ground chicken, gently seasoning to give it a south-of-the-border flair. He quickly runs to check row after row of chickens that are slowly absorbing the savory flavor of hickory smoke. His rice cookers are starting to steam, nearly ready to offer up pounds of healthy carbs. He maintains focus on this culinary orchestration with a singular goal: preparing healthy, home-style meals for as many Paducahans as possible. His ability to frustrate others is what led him here. "I've always been able to gain or lose weight easily," says Nathan. "We did a biggest loser contest at work, and everyone immediately said that I would win because I'm good at it. I shared with them what I was doing with my food, and I made some meals for a couple of guys. Then it just took off. I started getting calls from people I didn't know wanting meals like their friends were eating." Nathan's first round of preparation began with forty-two meals, but the demand grew so large so fast that Nathan leased a spot with a commercial kitchen in order to keep up with new orders. In that, Paducah Meal Prep was born. "The first week, I had about 200 meals to make," adds Nathan. "The next week, I had 375, and the next around 740." Nathan hired a couple of employees, and the growth continued by word of mouth. Customers made weekly orders, and Nathan and his staff prepared them on Sundays and Mondays with pickups on Monday evenings. Refrigerated meals last up to four days, and Nathan keeps the cost low by buying his ingredients in bulk from places like Hughes Meat Market. "The meals are based on a lean protein, a complex carb, and a vegetable," says Nathan. "We also do a lot bulks orders. I just got one in for six pounds of steak." Nathan began slow-smoking meats and crafting breakfasts. Menu items included everything from whole wheat pancakes with eggs and turkey bacon to gochujang pork with kimchi fried jasmine rice. And the orders kept on coming. For Nathan, cooking in bulk is nothing new. "I was a cook in the military in Kuwait," he says. "I had 75 people at night who cooked for me. I did the midnight meal and breakfast. We fed about 5,000 people a day." While the numbers at Paducah Meal Prep haven't grown to quite that number, the numbers climbed enough that Nathan had to look for yet another location. In January, Paducah Meal Prep moved to Lone Oak with regular weekday hours and a salad bar. And by the end of January, they were preparing 1,400 meals a week. "The community has really taken to what we are doing," says Nathan. "We have a lot of customers with children, and they are busy everyday and had been picking up fast food later at night on the way home. These are more home-cooked style meals and healthier for their families. Others are working to stay fit, and they want meals that support their goals. And some are needing meals for lunches. They are super easy and good for you." 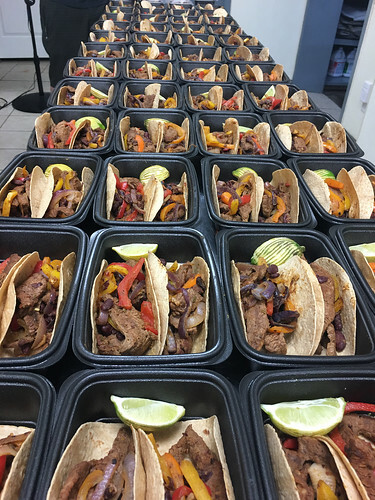 Nathan's panache for healthy meal prep went from his friends' curiosities to a thriving Paducah business, burgeoning within an ever-increasing desire to balance quick, easy, and healthy. "It's been amazing!" says Nathan. Info on Paducah Meal Prep can be found on their Facebook page and at paducahmealprep.com. Orders can also be make via the Paducah Meal Prep app available in app stores.